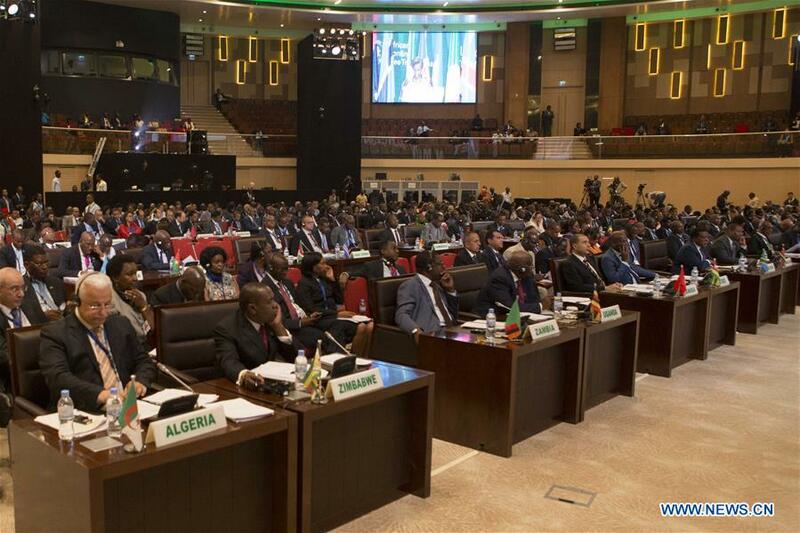 KIGALI, March 19 (Xinhua) — UN and the African Union (AU) officials on Monday urged African countries to take more measures as Africa is launching the African Continental Free Trade Area (AfCFTA). African countries should realize that what they make of the AfCFTA is up to them, said Louise Mushikiwabo, chairperson of the AU Executive Council and Rwandan foreign minister, in Kigali, capital city of Rwanda. Each of African countries has to do its part, she said. African countries have to “work on establishing the administrative, legal and logistical structures,” said Mushikiwabo at the 18th Executive Council Meeting that kicked off in Kigali on Monday, as part of the AU Extraordinary Summit on the AfCFTA. If African countries want to significantly increase intra-African trade, they must address practical challenges such as burdensome regulations, access to finance by the private sector, infrastructure networks and simplification of customs processes, she said. Critical steps remain in advancing the AfCFTA, said Vera Songwe, Under-Secretary-General of UN and Executive Secretary of the UN Economic Commission for Africa. Africa must develop the national schedules for tariff reduction in trade in goods and for priority services, she said at the meeting. African countries must complete the annex on rules of origin and ensure that the agreement of launching the AfCFA is ratified through their respective national processes, said the official. “We must do so rapidly,” she said. The AU Executive Council brings together all AU member states, usually at the foreign minister level. The meeting is scheduled to consider the draft agenda and draft program work of the Extraordinary Session of the Assembly of Heads of State and Government of the AU on March 21. The executive council is also scheduled to consider the draft decision and declaration for the Assembly on the AfCFTA. African leaders are expected to sign an agreement that will launch the AfCFTA at the heads of state and government summit, according to the AU. “This is a historic pact which has been nearly 40 years in the making, and it represents a major advance for African integration and unity,” AU Chairperson and Rwanda’s President Paul Kagame said. Currently, Africa has regional economic communities such as the Economic Community of West African States, the Southern African Development Community and the Common Market for Eastern and Southern Africa. The AfCFTA will make Africa the largest free trade area created since the formation of the World Trade Organization, according to the AU. The AfCFTA could create an African market of over 1.2 billion people with a GDP of 2.5 trillion U.S. dollars, the pan-African bloc said. The UN Economic Commission for Africa estimates that the AfCFTA has the potential to boost intra-Africa trade by 53 percent by eliminating import duties and non-tariff barriers. The council meeting would also consider and adopt a draft African common position for post-2020 on the African, Caribbean and Pacific Group of States, which is composed of 79 African, Caribbean and Pacific states. The African common position is included in the summit agenda because of its relevance and the urgent need for the African side to have its negotiating tool, said Kwesi Quartey, the deputy chairperson of the AU Commission.